Many state-of-the-art SAT solvers use the VSIDS heuristic to make branching decisions based on the activity of variables or literals. In combination with rapid restarts and phase saving this yields a powerful decision heuristic in practice. However, there are approaches that motivate more in-depth reasoning to guide the search of the SAT solver. But more reasoning often requires more information and comes along with more complex data structures. This may sometimes even cause strong concepts to be inapplicable in practice. In this paper we present a suitable data structure for the DMRP approach to overcome the problem above. Moreover, we show how DMRP can be combined with CDCL solving to be competitive to state-of-the-art solvers and to even improve on some families of industrial instances. 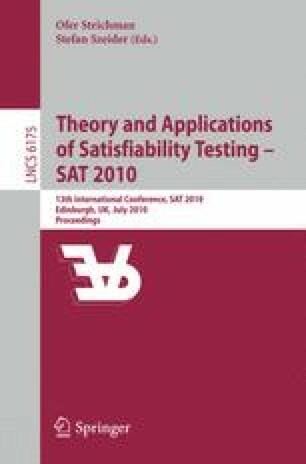 This work was supported by DFG-SPP 1307, project “Structure-based Algorithm Engineering for SAT-Solving”.